State parks are made for adventures in nature. Whether hiking, fishing, swimming, boating or simply enjoying a picnic in the fresh air, they are excellent spots for family time. The following Massachusetts state parks offer all these opportunities—and a few surprises, too. Check one or more out as you make your summer and fall plans. Rent a kayak or canoe at Hopkinton State Park and enjoying fishing on Hopkinton Reservoir, which is amply stocked with fish. Bring a picnic and spend the day in the great outdoors. Swim, hike, play games and more. Grills are available, as are bathhouses. Camping, hiking, fishing and boating make Wells State Park an excellent spot for enjoying the great outdoors. A hike up Carpenter Rocks affords a pristine view of the entire park. Out of state guests who visit nearby Sturbridge Village often camp here in the summer, so check for reservation availability before heading here. Ellisville Harbor State Park is an excellent place to wade in the surf, scour the beach for driftwood, hike, fish and picnic. Harbor seals are typically visible from the shoreline. An historic mansion is situated at Borderland State Park. It is open for tour during regular park hours. Also on site is a pond for fishing and canoeing or kayaking. There are trails for hiking, biking or horseback riding. A picnic area and grills are available, too. Enjoy swimming, fishing, canoeing, kayaking, hiking and more at Nickerson State Park. Reserve a camping spot and take in all that Cape Cod offers. Showers and rest rooms are available and day visits are permitted. There’s also a playground for the kids. Natural Bridge State Park is home to one of the surprises mentioned above. The only natural white marble arch in the entire United States is located here. Made of bedrock marble that’s approximately 550 million years old, the bridge was carved by melting glacial waters. The bridge spans Hudson Brook, and flows into a 60-foot gorge. 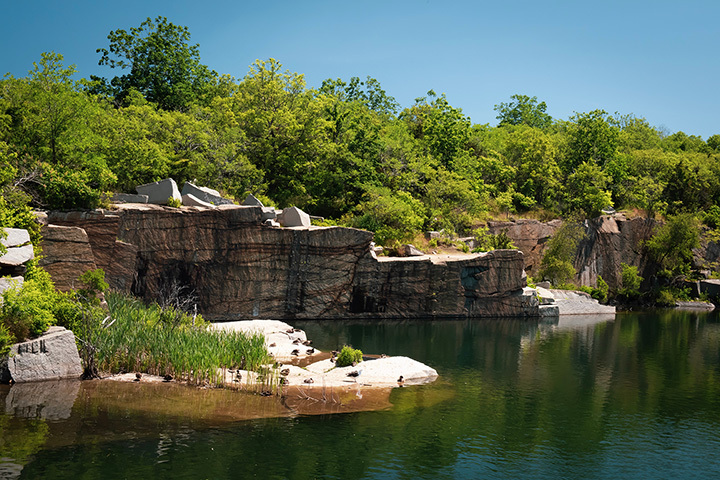 An abandoned marble quarry may be toured at the park, too. An active dairy farm sits in the middle of Great Brook Farm State Park, and tours are available on weekend days. The park also features 20 miles of hiking trails with evidence of settlers from past generations all along the way. Seventeenth-century cellar holes may be viewed—and hopefully avoided. There’s a boat ramp leading to a pond for boating and fishing. For a beautiful view of the Boston skyline, visit Webb Memorial State Park. Situated on a peninsula that extends into Hingham Bay, the park offers fishing, canoeing and kayaking opportunities. There’s a picnic areas, so pack a lunch and spend the day. On site rest rooms are available, too. Swim in the Westfield River or cast your line and do some fishing. Float in your kayak or canoe. Robinson State Park offers these opportunities and more. Hike or ride your mountain bike along 40 miles of trails. Grills, a picnic area and rest rooms are available, too. At Halibut Point State Park, visitors are treated to a view of Maine’s Mount Agamenticus on a clear day from the 60-foot observation tower. New Hampshire’s Isles of Shoals are often visible, too. Trails, tidal pools and rocky ledges provide a variety of activities as well as an up close and personal view of the history of granite in nearby Cape Ann.